Leaders Shefford Town & Campton secured a 7-2 home win over a Wilstead side suffering their fifth straight away defeat. Henry Snee, Sam King, Adam Spoors, Ryan Lewis, George Renney, Mitchell Foley and Ross Harkins all found the back of the net for the Town againt a Wilstead brace in reply from Luke Pursey. Second place Cranfield United beat Caldecote 6-0. 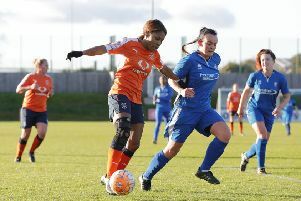 Courtney Boughton with a brace was joined on the United scoresheet by single goals from Josh Sturnilo, Delroy Phillps, Justin Newman and Charisma Agyemang. Over at Weston Park third place Wootton Blue Cross claimed a 2-1 home victory over Riseley Sports - Jamie Sawyer and Kudz Makaza on the Blue Cross scoresheet against a Sports reply via Mitchell Crook. Crawley Green Reserves lost 3-2 at home to Flitwick Town. Phil Matthews with a brace and a lone strike from Rhys Pearson were the Town marksman against home replies via James Younger and Jamie Hunter. Now just a point behind Green in fifth are Stevington who ran out 5-1 home winners over AFC Kempston Town & Bedford College. Kieran Souter with a brace and single goals from Ben Walsh, Billy Roberts and Aaron Hewitt brought up the nap hand against a lone Town reply from Tom Vandenberg. Queens Park Crescents beat Ickwell & Old Warden 5-2. Chisom Amadi with a brace plus single goals from Shahinur Rahman, Danial Rasol and Mohammed Abbass on the Crescents scoresheet against visiting replies via Scott Alleyne and Andrew Vallom. Marston Shelton Rovers were 5-4 winners at AFC Oakley M&DH. Nick Skolsky led the way with a hat-trick, being joined on the Rovers scoresheet by single goals from Matthew Eddy and Ben Lawrence against M&DH replies via Zach Ives with a brace plus single strikes from Elijah Hukin and George Cox. Bedford Albion’s lead in Division One supported by O’Neills is now nine points following a 4-1 home victory over close rivals Cranfield United Reserves who lost their unbeaten record as a result. Paul Babbington, Chris Wright, Adam Lewis and Lian Fenton scored for Albion against a lone United reply from Joe Sames. Biggleswade FC Reserves moved second after a 10-3 home win over Cople & Bedford SA. Cian Mitchell, John Veal and Oscar Smith all claimed hat-tricks alongside a single goal for George Riley against SA replies via Ollie Hughes twice and Lewis Fox once. Shefford Town & Campton Reserves are third after winning 1-0 at Lea Sports PSG thanks to a goal from George McDonagle. Dropping into fifth are Wixams who were beaten 4-2 at home by The 61FC Luton Reserves. Dylan Gittens with a brace plus single goals from Marcus Gittens and George Onwusonye marked the 61 scoresheet against home replies via Mason Hornibrook and Gareth White. Totternhoe Reserves won 4-2 at Wilstead Reserves. Adam Worthington with a brace plus goals from Archie Taylor and Pearce Tracey did the damage against home replies via Steff Jones and Filip Hammond. Jonnie Stratford scored twice for Sandy FC but it wasn’t enough to stop them slipping to their tenth straight defeat. They lost 4-2 at AFC Kempston Town & Bedford College Reserves, Percy Ronayne netting twice including one from the penalty spot, with further strikes from Bryn Reynolds and Steven Capener. Flitwick Town Reserves claimed a 3-1 home win over Henlow. Josh Arthur-Kent, Dom Collins and Mark Bartlett were the Town marksman against a lone reply from Alex Toye. With leaders Houghton Athletic sitting the afternoon out their lead is now down to a single point after Atletico Europa ran out 6-0 winners at Marston Shelton Rovers to take their unbeaten away ways up to eight games. Abuki Sulyman led the way with a hat-trick, Paddy Almanji adding a brace and Aaran Van-Horn scoring the other. But the biggest away winners were Sporting Lewsey Park who made it four away wins on the bounce by winning 8-1 at Unite MK Reserves. Chris Gibson with a brace was joined on the Park scoresheet by single goals from Jonathan Barnett, Dean Whittaker, Sean Fahy, Luke Lincoln, Lee Mooney and Scott Murchie against a lone Mk reply from Callum Cloke. M&DH Clapham Sports won for the first time in six outings with a 4-3 victory at Caldecote Reserves. Owen Tuffin with a hat-trick plus a single strike from Matt Darby marked their scoresheet against home replies via Martin Chappell, Jack Stagg and Carl Heath. Completing a 100% sweep for the away sides were Luton Leagrave AFC who triumphed 4-1 at St Joseph (Saturday) – Hartley Coleman, Loiue Grant, Tony Clark and Ciaran Connelly all found the back of the net against a lone Joe’s reply from Simon Richards. Elstow Abbey will face a home quarter-final tie next weekend against Sporting Lewsey Park after a lone goal from Travis Joseph took them to a 1-0 victory at Clifton. CS Rovers were 4-3 home winners over AFC Oakley M&DH Reserves and will now travel to MK Unite Reserves on the same afternoon. Dalitso Chibwe with a hat-trick and a single goal from Daniel Gallagher were n the Rovers scoresheet against a hat-trick in reply from M&DH’s Joe Mcdonagh. Kempston Athletic safely made their way into the last four with a 5-2 home win over Sundon Park Rovers. Dan Mattin with a brace plus an own goal and strikes from Luke Mongiovi and Lee Leonard brought up the Athletic nap hand against Rovers replies via Tay Roberts and Luke Evans. Joining them in the last four are Black Swan ( Luton) who won 3-0 at Meltis Albion, Ben Smith, Joe Grossi and Danny McGovern all finding the back of the net. Harlington Juniors’ 3-2 victory duly sent leaders Pines ( Luton) to their first league defeat of the season. Alex Frantellizzi , Nick Buttigieg and Daryl Tapfuma were on the Juniors scoresheet against Pines replies via Garry Duncan and Damien Fields. However, their lead at the head of the table is 14 points, clear of now second place Real Haynes who were 7-1 home victors over Square FC. Billy Flack led the way with a hat-trick and was joined on the home scoresheet by single goals from Tyler Winter, Josh Brown, Harry Mabbitt and Hayden Dormer against a lone visitors reply via Conner Taylor. Just a point behind them in third, and having played a game less, are Bedford Albion Reserves who chalked up a 13-0 home win over Real Haynes Reserves. Stefan Bucur with a hat-trick, Craig Hanna with a brace plus single goals from Rushane Hendricks, Adam Wodecki, Josh Emmerton, Gary Townsend, Ash McDonald and Arran Fletcher dishing out the punishment. Dropping from second to fourth are FC Poloina (Luton) who were beaten 4-1 at Stevington Reserves for whom it was a fourth home win on the bounce. Carlo Stramglia, Fabiano Cammarano, Dan Leton and Jamie Daniels scored the goals to do the damage against a lone reply via Prezemek Gorczyca. Now in fifth are Shefford Town & Campton A who won 5-1 at Lidlington United Sports. Kyle Cook with a brace plus single goals from Glen Cook, Josh Holland and Jacob Jevan brought up the nap hand against a lone United reply from Jamie Rodd. Wixams Wanderers won 7-3 at Dinamo Flitwick to condemn the hosts to their sixth home defeat on the bounce. Tom O’Nell led the way with a hat-trick and he was joined on the Wanderers scoresheet by braces from Michael France and Joe Holmes against home replies via a double for Lewis Yates and a single from Reeve Fievez. Thurleigh were the 3-1 home winners over Wootton Village – Ethan Potts, Bradley Raines and Ross McMillan netting the goals against a lone Village reply from Dan Smith.